Custom Refrigerated Wine Cabinet – North Shore Modern Home – Featured Project | Glenview Haus | Chicago. Custom Front Entry and Interior Doors, Custom Wine Cellars, Custom Cabinets. A recent project in Chicago’s North Shore suburbs embraces a growing trend in home wine storage – custom refrigerated wine cabinets. These hybrid storage solutions are more than just space-conscious options for urban wine collectors. Wine cabinets are increasingly the go-to option for modern wine enthusiasts in all locales. Combining the easy access of a wine fridge with the sophisticated display of a large wine cellar, custom refrigerated wine cabinets are the modern wine collector’s dream. 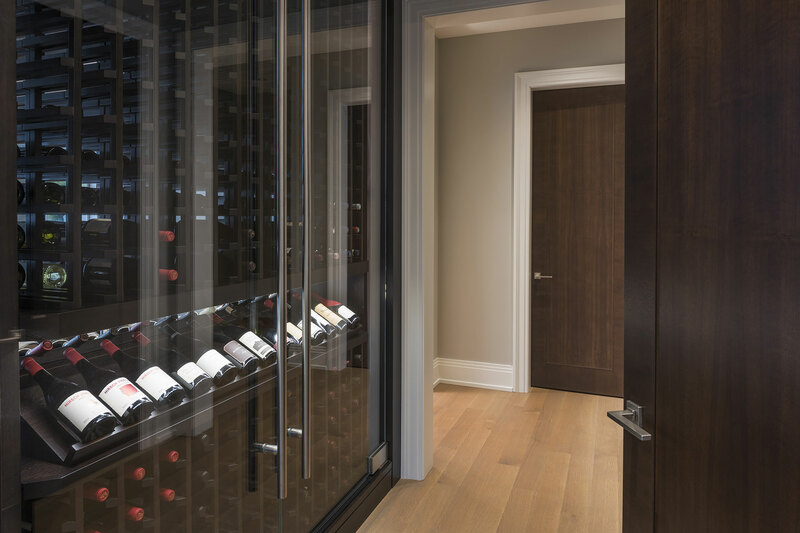 Although the newly constructed home had plenty of space for a traditional wine cellar, the owner chose a double-sided custom wine cabinet to display his collection as part of the living space. The incredible suburban home features custom doors, cabinets, bookshelves, and wood panel trims in rich mahogany that fill the space. There is a pleasant continuity from room to room. Sleek contemporary lines pair flawlessly with carefully chosen traditional elements to create a stunning transitional interior. Glenview Haus designed the custom double-side wine cabinet to blend seamlessly with the home’s details and finishes. In addition to doubling the storage capacity to that of a wine cellar, the double-sided, built-in cabinet serves as part of the wall between the dining room and hallway, creating a unique “wall of wine” in two rooms of the house. The cabinet is accessible from both the hallway and the dining room.